When we see magma on the ground, we call it lava. This lava is coming out of a volcano in Hawaii. In volcanology, magma is melted rock that is under the ground. Magma is the molten rocks in Earth's mantle. Magma exists as pockets and plumes beneath the surface of the Earth. Magma is a molten and semi-molten rock mixture found under the surface of the Earth. This mixture is usually made up of four parts: a hot liquid base, called the melt; minerals crystallized by the melt; solid rocks incorporated into the melt from the surrounding confines; and dissolved gases. Magma is extremely hot—between 700° and 1,300° Celsius (1,292° and 2,372° Fahrenheit). This heat makes magma a fluid, able to create new landforms. The heat also makes physical and chemical changes to old landforms. There are many types of magma. One is called felsic magma. Felsic magma is thick (high viscosity) and has much of a mineral called silica. It mostly makes light-coloured rocks. Another type is called mafic magma, which is runny and has less silica. It usually makes dark-coloured rocks. A third type is intermediate magma. It is like both the other types. When magma becomes solid it's usually by cooling slowly, far below the surface. This makes "plutonic" rocks such as granite. When magma comes out from the ground in a volcano and it is still melted, it is called lava. Lava cools more quickly, and forms other kinds of rock such as basalt. When magma is ejected by a volcano or other vent, the material is called lava. Magma that has cooled into a solid is called igneous rock. Hawaiian magma is different than magma in other parts of the Earth because it has more molten rock and less dissolved gases. This kind of magma makes fewer explosions than gassy magmas do. The Hawaiian volcano Kilauea, on the "Big Island" of Hawaii, has erupted with enough molten lava to pave a road around the Earth three times. In 2009, the Icelandic Deep Drilling Project created a well that uses magma to generate geothermal energy. Normally, geothermal energy is created by pumping water into hot volcanic bedrock, creating steam that then drives a turbine to generate electricity. While normal geothermal sources average around 60° to 80° Celsius (140° to 176° Fahrenheit), the magma well’s steam reached a record-breaking temperature of 450° Celsius (842° Fahrenheit)! This huge increase in temperature allowed just one magma well to generate roughly 36 megawatts of electricity, powering 36,000 homes. In comparison, one single wind turbine generates between 1 to 3 megawatts, and some steam power stations generate over a thousand megawatts. Earth is divided into three general layers. The core is the superheated center, the mantle is the thick, middle layer, and the crust is the top layer on which we live. Magma originates in the lower part of the Earth’s crust and in the upper portion of the mantle. Most of the mantle and crust are solid, so the presence of magma is crucial to understanding the geology and morphology of the mantle. Differences in temperature, pressure, and structural formations in the mantle and crust cause magma to form in different ways. Decompression melting involves the upward movement of Earth's mostly-solid mantle. This hot material rises to an area of lower pressure through the process of convection. Areas of lower pressure always have a lower melting point than areas of high pressure. This reduction in overlying pressure, or decompression, enables the mantle rock to melt and form magma. Decompression melting often occurs at divergent boundaries, where tectonic plates separate. The rifting movement causes the buoyant magma below to rise and fill the space of lower pressure. The rock then cools into new crust. Decompression melting also occurs at mantle plumes, columns of hot rock that rise from Earth’s high-pressure core to its lower-pressure crust. When located beneath the ocean, these plumes, also known as hot spots, push magma onto the seafloor. These volcanic mounds can grow into volcanic islands over millions of years of activity. Magma can also be created when hot, liquid rock intrudes into Earth’s cold crust. As the liquid rock solidifies, it loses its heat to the surrounding crust. Much like hot fudge being poured over cold ice cream, this transfer of heat is able to melt the surrounding rock (the “ice cream”) into magma. Transfer of heat often happens at convergent boundaries, where tectonic plates are crashing together. As the denser tectonic plate subducts, or sinks below, or the less-dense tectonic plate, hot rock from below can intrude into the cooler plate above. This process transfers heat and creates magma. Over millions of years, the magma in this subduction zone can create a series of active volcanoes known as a volcanic arc. Flux melting occurs when water or carbon dioxide are added to rock. These compounds cause the rock to melt at lower temperatures. This creates magma in places where it originally maintained a solid structure. Much like heat transfer, flux melting also occurs around subduction zones. In this case, water overlying the subducting seafloor would lower the melting temperature of the mantle, generating magma that rises to the surface. Magma leaves the confines of the upper mantle and crust in two major ways: as an intrusion or as an extrusion. An intrusion can form features such as dikes and xenoliths. An extrusion could include lava and volcanic rock. Magma can intrude into a low-density area of another geologic formation, such as a sedimentary rock structure. When it cools to solid rock, this intrusion is often called a pluton. A pluton is an intrusion of magma that wells up from below the surface. Plutons can include dikes and xenoliths. A magmatic dike is simply a large slab of magmatic material that has intruded into another rock body. A xenolith is a piece of rock trapped in another type of rock. Many xenoliths are crystals torn from inside the Earth and embedded in magma while the magma was cooling. The most familiar way for magma to escape, or extrude, to Earth’s surface is through lava. Lava eruptions can be “fire fountains” of liquid rock or thick, slow-moving rivers of molten material. Lava cools to form volcanic rock as well as volcanic glass. Magma can also extrude into Earth’s atmosphere as part of a violent volcanic explosion. This magma solidifies in the air to form volcanic rock called tephra. In the atmosphere, tephra is more often called volcanic ash. As it falls to Earth, tephra includes rocks such as pumice. In areas where temperature, pressure, and structural formation allow, magma can collect in magma chambers. Most magma chambers sit far beneath the surface of the Earth. The pool of magma in a magma chamber is layered. The least-dense magma rises to the top. The densest magma sinks near the bottom of the chamber. Over millions of years, many magma chambers simply cool to form a pluton or large igneous intrusion. If a magma chamber encounters an enormous amount of pressure, however, it may fracture the rock around it. The cracks, called fissures or vents, are tell-tale signs of a volcano. Many volcanoes sit over magma chambers. As a volcano’s magma chamber experiences greater pressure, often due to more magma seeping into the chamber, the volcano may undergo an eruption. An eruption reduces the pressure inside the magma chamber. As long as more magma pools into a volcano’s magma chamber, there is the possibility of an eruption and the volcano will remain active. Large eruptions can nearly empty the magma chamber. The layers of magma may be documented by the type of eruption material the volcano emits. Gases, ash, and light-colored rock are emitted first, from the least-dense, top layer of the magma chamber. Dark, dense volcanic rock from the lower part of the magma chamber may be released later. In violent eruptions, the volume of magma shrinks so much that the entire magma chamber collapses and forms a caldera. All magma contains gases and a mixture of simple elements. Being that oxygen and silicon are the most abundant elements in magma, geologists define magma types in terms of their silica content, expressed as SiO2. These differences in chemical composition are directly related to differences in gas content, temperature, and viscosity. Mafic magma has relatively low silica content, roughly 50%, and higher contents in iron and magnesium. This type of magma has a low gas content and low viscosity, or resistance to flow. Mafic magma also has high mean temperatures, between 1000o and 2000o Celsius (1832o and 3632o Fahrenheit), which contributes to its lower viscosity. Low viscosity means that mafic magma is the most fluid of magma types. It erupts non-explosively and moves very quickly when it reaches Earth’s surface as lava. This lava cools into basalt, a rock that is heavy and dark in color due to its higher iron and magnesium levels. Basalt is one of the most common rocks in Earth’s crust as well as the volcanic islands created by hot spots. The Hawaiian Islands are a direct result of mafic magma eruptions. Steady and relatively calm “lava fountains” continue to change and expand the “Big Island” of Hawaii. Intermediate magma has higher silica content (roughly 60%) than mafic magma. This results in a higher gas content and viscosity. Its mean temperature ranges from 800o to 1000o Celsius (1472o to 1832o Fahrenheit). 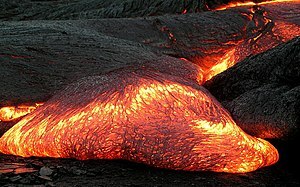 As a result of its higher viscosity and gas content, intermediate magma builds up pressure below the Earth’s surface before it can be released as lava. This more gaseous and sticky lava tends to explode violently and cools as andesite rock. Intermediate magma most commonly transforms into andesite due to the transfer of heat at convergent plate boundaries. Andesitic rocks are often found at continental volcanic arcs, such as the Andes Mountains in South America, after which they are named. Felsic magma has the highest silica content of all magma types, between 65-70%. As a result, felsic magma also has the highest gas content and viscosity, and lowest mean temperatures, between 650o and 800o Celsius (1202o and 1472o Fahrenheit). Thick, viscous felsic magma can trap gas bubbles in a volcano’s magma chamber. These trapped bubbles can cause explosive and destructive eruptions. These eruptions eject lava violently into the air, which cools into dacite and rhyolite rock. Much like intermediate magma, felsic magma may be most commonly found at convergent plate boundaries where transfer of heat and flux melting create large stratovolcanoes. This page was last changed on 12 March 2018, at 22:03.